Millions of webmasters the world over woke up in a panic this morning in anticipation of so-called “Mobilegeddon,” Google’s latest algorithmic update that will prioritize mobile-friendly sites in the SERPs. It’s too soon to say how much of an impact the update has had, but amid the chaos, one question remains unanswered – how long will it be before the same thing happens to paid results? Make no mistake, friends. 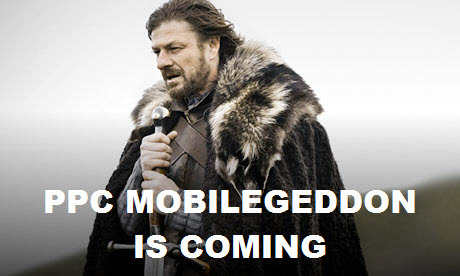 PPC’s very own Mobilegeddon is coming. Mobile Optimization: The Next PPC Metric? Google hasn’t been shy about its intentions to push everyone toward a more mobile-friendly Web, but the latest update isn’t just about an algorithm update; it’s a declaration of a bold new philosophy that rewards form factor over accuracy. Yes, Google has reassured us that quality content and relevance will still be important ranking factors, but as we’ve already seen, some sites have suffered immediate reductions in traffic simply because their sites aren’t optimized for mobile. Rankings really matter here, since mobile SERPs tend to be winner take all. By prioritizing mobile-friendly sites over their desktop-friendly counterparts, Google is effectively telling us that content is now secondary. Who cares if there are better, more accurate results out there? These results look better on your phone, so these are the ones we’re going to show you first. Will this result in a better user experience? Maybe. Will it result in a bigger potential share of the rapidly growing mobile advertising market for Google? Absolutely, unequivocally yes. The question isn’t why would Google apply the same philosophy to ads, but why wouldn’t it? Testing an algorithmic transition of this magnitude on organic results first makes a lot of sense. After all, with $50 billion riding on its advertising business, Google probably doesn’t want to slap its advertisers around as hard – at least for now. They’re paying guests, after all, not lucky winners who’ve risen to the top for free, right? 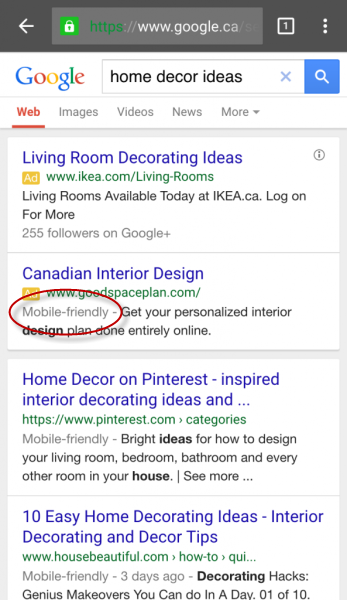 However, we’re already seeing the first stages of the coming paid search Mobilegeddon, with sightings of “mobile-friendly” tags alongside PPC ads, as The SEM Post reported this morning. 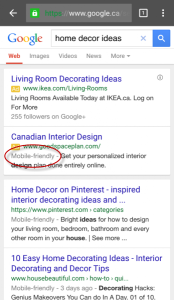 As you can see, the “mobile-friendly” tag is appearing alongside the top two organic search results, but it’s also being displayed next to an ad. Before long, I predict that Google will start giving more weight to mobile optimization as part of its Ad Rank formula. We already know that the Ad Rank formula has been tweaked to prioritize ads that make better use of Google’s features. Remember when Google started awarding “bonus points” for the use of ad extensions? It didn’t take long before these “bonus points” found their way into the Ad Rank formula. Ad Rank used to be calculated as bid multiplied by Quality Score, or (bid * QS = Ad Rank). It then became bid multiplied by Quality Score, plus the bonus points from ad extensions, or (bid * QS + ad extension bonus points = Ad Rank). Now, it seems as though Google is about to start throwing mobile-friendliness into the equation. Obviously Google is reluctant to specify exactly how Quality Score is calculated. However, Google has admitted in the past that how an ad displays across several types of device is at least one factor it takes into consideration when calculating Quality Score. It’s hardly inconceivable that the weight given to an ad’s mobile-friendliness could be amplified in the future, given Google’s forceful push toward a much more mobile Web. Brace Yourselves: PPC #Moblegeddon Is Coming! Although webmasters may still be determining the extent of the damage their sites suffered in today’s Google mobile update, it’s time we started preparing for the next onslaught. To me, there is no doubt whatsoever that Google will apply this same philosophy to its paid results – the only question is when. This doesn’t necessarily have to be the apocalyptic event many believed today’s Mobilegeddon update would be. After all, you don’t have to overhaul an entire site to ensure that ads are deemed mobile-friendly, since this has to be determined by the accompanying landing pages. It should, however, serve as a warning. Several sites have already reported significant drops in traffic as a result of today’s update, and the storm could be even more severe for advertisers who fail to take appropriate action.